Gold Factory is a strikingly original video slot game from Microgaming that takes players to a stylized factory environment where they can win untold riches while enjoying sleek animations and really diverting bonus games, as well. This game can be played at Microgaming casinos. The symbols in Gold Factory are very indicative of the theme itself. They include the game’s logo, a rich man, a train, hot air balloon, cart full of gold, a pile of coins, and more. During some wins, the gold factory snaps into action, with gold coming down chutes and trains moving around. There are quite a bit of such animations to go with the upbeat music that will provide the perfect backdrop to an enjoyable experience. Gold Factory’s coin values are comparatively low to similar video slot games, perhaps because you can bet so many coins per spin. The values start at 1 cent and continue to 2 cents, 5 cents and 10 cents as a maximum coin value. The standard jackpot caps at 7,500 coins, which means you can win $750 if you have the maximum coin value when you bet. Changing coin values and betting different numbers of coins per line can change the jackpot amount, as well. With five Gold Factory logos, you can win the jackpot of 7,500 coins. The scatter jackpot is one of the highest in the industry at 10,000 coins, as well. With bonuses and the right circumstances, you can win hundreds of thousands of coins in this game. The wild symbol is the Gold Factory logo, while the scatter symbol is the gold coin, with which you can either win a nice amount, enter the bonus game, or both. At first, you’ll get a free spins feature where according to your choice, you can get between 10 and 35 free spins, with your earnings doubled in the duration. Gold Factory features not one, but two bonus games. In the Gold Factory game, you choose four hoppers in a boiler room that have gold on them, revealing prizes all the while. The maximum amount you can win in the bonus game is a whopping 619,000 coins. The Reactor Bonus is the other bonus feature, and a place with 12 operational points. You move them and get bonuses until you select a malfunctioning point, of which there are two in the reactor. When you’re finished, you get a compensatory payout dependent on your performance and bet amount. 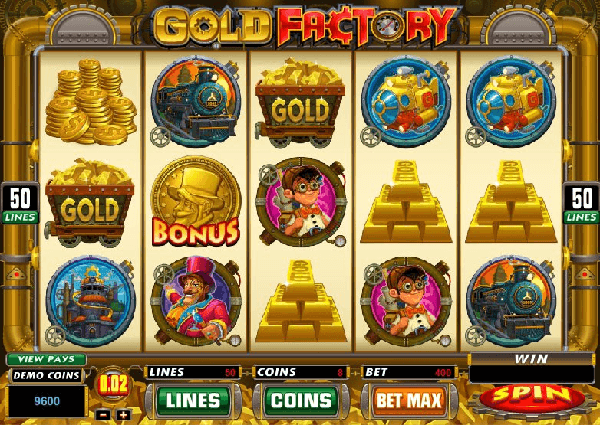 Gold Factory is a very modern video slot, with great bonus features, excellent animations and a very cool theme. Not only can you win some money while playing, but you will likely have a great time, too.